Holiday baking is one of my favourite traditions. I’ve been doing it since I became a mom at age 20. Back then, I picked a few recipes from an old cookbook and spent the day in the kitchen. The first time I made way too much and we ended up having to give a lot of it away. Fast forward 15 years and I still enjoy baking treats and love to see the smile on my family’s faces when they take a bite. Baking always puts me in the holiday spirit! There’s only one thing I don’t like about holiday baking….all those extra calories! I’ve been watching what I eat for the past 2 years and I know I’m going to have a hard time saying no to these delicious desserts. I mean I need to taste them all right? There’s another option though that I’m looking into using….Pure Via! It’s a naturally-sourced sweetener made from the Stevia plant and has less calories. It can be used as a replacement for sugar in your baking, coffee/tea, cereals, fruits, etc and is suitable for people with diabetes or gluten intolerance. I found a recipe for a Pumpkin Cake Roll that I’ve added to my list of new recipes to try this season. 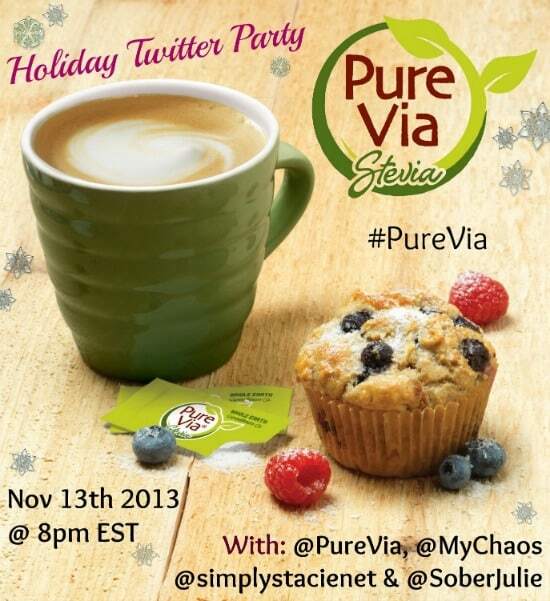 Join the #PureVia Twitter Party on November 13th at 8 pm EST! We’ll be chatting about holiday baking with Pure Via and recipes to try. Plus, there will be prizes! Follow the party hosts and then add your Twitter Handle to the linky below. Sounds interesting, I’ll try to check it out! PureVia is my favorite sweetener. I use in iced tea, coffee, oatmeal, and on top of corn flakes. It has a nice, sweet flavor without the aftertaste that so many artificial sweeteners leave behind. I could use some new recipes! A family member was recently diagnosed with diabetes, so I’m looking for some holiday recipes we can all enjoy.